RBTH presents a selection of views from leading Russian media on the latest developments in Ukraine, including reports on the continuing hostilities around Donetsk, Kiev’s replenishment of its military hardware, as well as analysis of Moscow’s position and a potential partial retraction of sanctions by the European Union. Moskovsky Komsomolets writes that there has been no real ceasefire in eastern Ukraine. “There does not seem to be a visible ceasefire in the Donetsk Region. There are visible ‘hot spots’ – Debaltsevo, Donetsk, Mariupol. Armed formations from the [self-proclaimed] Lugansk People’s Republic are constantly attempting to surround Debaltsevo. There is constant shelling of the city and the surrounding area. In Donetsk, an attack is under way on the airport and heated battles in an arc around it – Peski, Avdeyevka. The Ukrainians are still firmly there,” the newspaper reports. People are returning to Donetsk, despite the ongoing hostilities. “Around 15,000 people have already arrived. A lot of people with children and the elderly. They believed in the ceasefire and are trying hard to ignore it, which is quite difficult, given the constant gunfire,” a Moskovsky Komsomolets correspondent reports. Citing Ukrainian President Petro Poroshenko, Vzglyad reports that “Ukraine has received everything necessary in terms of military equipment from the United States and other Western countries.” Despite admitting that two-thirds of Ukraine’s military hardware has been destroyed, Poroshenko remains optimistic for the future. Vzglyad writes that the Ukrainian president “has cheerfully noted that the losses to military equipment have already been replenished” and referred to the promises of new supplies that he secured in his latest visits to the U.S. and Canada. However, Barack Obama has promised only monetary aid, and a very modest $53 million at that. “Contrary to Poroshenko’s stirring statements, Ukrainian military analysts admit that it is too early to talk about supplies of Western weapons,” Vzglyad reports. 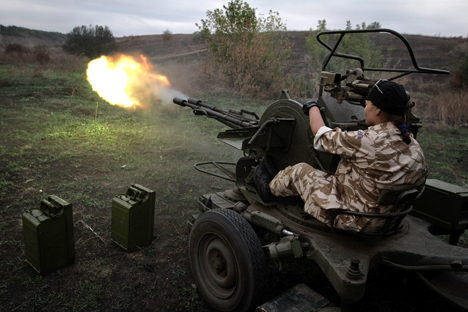 In the newspaper’s opinion, Ukraine is unlikely to be able to count on real military support. “In the best-case scenario, the U.S. and other NATO countries will give Poroshenko armored vehicles from the former Warsaw Pact countries,” the newspaper writes. Expert magazine analyzes Moscow’s approach to the conflict in the Donbass. Nationalists are referring to Moscow’s position as “the drain of the Donbass” and to the signing of the Minsk protocol as a betrayal of Russia’s national interests. However, in Expert’s opinion, the Kremlin is adhering to a pragmatic approach and has no intention of turning the southeast into a springboard from which to take over the entire country. Moscow needed the situation to stabilize in Ukraine in order to reduce the intensity of confrontation with Europe and to prevent itself falling subject to further sanctions. Furthermore, Russia does not want the total and rapid collapse of the Ukrainian government or a coup, which would have been realistic options if Kiev had continued to experience failures in its ‘anti-terrorist’ operation. All of Moscow’s current maneuvers are aimed at shifting the process towards a slower, calculable, relatively safer direction. “Vladimir Putin was and is a supporter of the federalization of Ukraine. However, the prospect of federalization is growing dimmer by the day. The Ukrainian authorities are tenaciously refusing to reformat their failed state project into a more effective structure. And in this situation, a conditional plan B is being implemented,” Expert explains, arguing that a buffer state is being created. The Kommersant daily, citing “a source in EU structures,” writes that the European Union may launch the process of revising its sanctions against Russia on September 30. After the latest sanctions went into effect, European Council President Herman van Rompuy said that the EU might change, suspend, or cancel the sanctions partially or fully depending on whether or not the Minsk agreements are implemented. Kommersant reports that the EU’s foreign policy service is slated to present “a comprehensive overview of the implementation of the Minsk peace plan and, more specifically, the ceasefire regime” on September 30. After the report has been read, a decision will be made regarding how to proceed with the sanctions against Russia. “In the most favorable scenario for Moscow, there may be a gradual cancelation of part of the restrictive measures,” Kommersant writes. The EU adopted nine packages of sanctions against Russia starting on March 17. Personal restrictions affected 119 individuals and 23 corporations, and sanctions were also imposed against the Russian energy, financial, and defense sectors. “In each of the nine rounds, a portion of the sanctions were connected with Crimea. These measures will remain in force even if the situation in the Donbass is settled,” Kommersant writes, citing its source in EU structures. If the EU begins lifting the sanctions, Russia may quickly respond in a reciprocal manner, the newspaper writes.